Thanks to a generous family member, I am now the proud owner of an entire shelf's worth of new cookbooks. This dear relative of mine never cooks, but has somehow amassed about a dozen cookbooks over the years, which he kindly shipped to me last week. Naturally, I'm in heaven, and there's good news for you too! A few that he sent me were repeats of cookbooks that I already own, so I'm having a giveaway to pass them on to you. Just know that they're not brand spankin' new, but if it has been used, it was used lightly and with love. The first book that I'm sharing with you is the classic The Joy of Cooking. If you'd like to know more about the book, I'd highly recommend checking out the Amazon page. It's full of fun facts like trivia, a historical timeline of the book, and celebrity reviews. To enter: Leave a comment on this post by noon Pacific Time on Friday, January 8th. You can say anything, tell me who you are, where you're from, what you like to cook, how you found Playing House, or just say hi! I'll pick a random winner on Friday night. funny, i've been planning a similar giveaway myself. gotta love those duplicate cookbook gifts - a great way to share the love. Would love a new cookbook! I found this site through a leetle card in my wallet. Do I win now? I'm not the non-cooking relative in question! i'm on an internet stumbling rampage while reviewing LOST and spent more time on your blog than the other food ones i've come across. that counts for something, right? I'm glad to have met you via Twitter. I like to cook a bit of everything - from Asian to European cuisine. A well used cook book means a well loved cook book. :) I love this type of cookbook. i can't recall exactly how i stumbled upon your lovely blog, but i think it was through tastespotting. terrific giveaway--thanks for the chance! Oh, that would be nice. Thanks! I've been considering a copy for some time...This would be grand. I have wanted to have this book in my cookbook set. I am always looking through my sister's. Happy New Year Amy! I don't have this cookbook (shocking I know ; ) but I sure would <3 one! I just recently started reading your blog, and I am loving it!! I am totally new at cooking; my husband typically cooks, but I've decided to try it a couple times a week. A cook book would help out a lot! Such a classic! I would love to win! I love to cook. I just recently started my cookbook library and I have a whopping 3 books. Please help me make it an even 4. Thanks so much for the opportunity to enter my name. What a great gift and how nice of you to share the wealth. Happy New Year, Amy! My mom and I spent Christmas in New York City this year. Among the many lovely things we did there, one was track down a vintage cookbook store in hopes of expanding my meager collection with a vintage, out-of-print gem. The store was amazing...but so overwhelming, we left with nothing! Oh silly us! Anyway, looking forward to Playing House all year long!! Hi Amy! I admit that I usually find more of my recipes through blogs (like yours!) than through cookbooks, but I'm trying to mend my ways. I'd love to give the Joy of Cooking a try! I would love, love, love a new cookbook! One of my resolutions is to cook more, eat out less. Great giveaway, you're too kind! My silent, secret New Year's resolution is to learn to cook-- & like it. My husband will eat anything; a by-product of having been homeless for several important years of his young life. I hate that he'll eat anything canned. At least he looks for MSG on the label now. I want to send him to work with something delicious & possibly nutritious. Halp. OxOx. I would love to have this cookbook. Happy new year! I would love to have this book! I want to learn how to cook more things, since I mainly stick to pasta and chicken! If you happen to cook anything (out of the Joy of Cooking or otherwise) from your garden this month, I'd love to include you in our Grow Your Own roundup again! I loved to browse my grandmother's old old old edition of this book and would like to check out the latest version! I found Playing House on SeriousEats.com in their photo section! I am DEF making those Lemon Bars! Great giveaway!!! I don't have this one and I'd love to add it to my collection! that is so exciting! i hope you enjoy the new cookbooks you received and it is so nice of you to share the ones you already had! i actually stumbled upon your site, but i bookmarked it and now i check back very often. i am looking forward to trying some of the recipes. I can't believe I don't own this! I stumbled upon your blog reading through the different blogs nominated through The Homies! I just got married a month ago and cooking was a major part of my bonding with my husband. Neither one of us had done much of it before, but we were both eager to learn, so we started together. Our time in the kitchen was filled with much laughter and priceless memories of our learning experiences. We still look forward to cooking together, as we both find it fun and therapeutic! I was just saying that I needed to add this classic cookbook to my collection!!! I love to cook and love cookbooks. However, The Joy of Cooking has never made it to my pantry. I would love to have this one. Hi I am Eve, and I love to cook southern foods and comfort foods as well. I love savory foods. cdziuba@aol.com I seriously read cookbooks like they're novels, hope I win! I like to cook anything - the more garlic the better! Nice giveaway. :) I'm not very big on cooking. It's only very recently that I've looked at various things online and cooking videos and am becoming more interested in trying to experiment and give cooking a real shot. Winning this would be really neat. Thank you for sharing the wealth. I hope you post some of the recipes with photos of the completed dishes you experiment with from your new cookbooks. I love to cook and this cookbook is a staple for every kicthen, yet I do not have it. funny enough, this is one book that I don't own (and would love to own!!!) Happy New Year, Amy!! Ohhh sweet! I have been wanting to get this cookbook for awhile now! I'd love to win! Be sure to check out my blog next week! I'm going to be doing a large cooking giveaway! You know who I am. :) I've really wanted this cook book for a long time. Ooh, did I tell you I got Martha Stewart cupcakes for Xmas? Love your blog as always, dear. 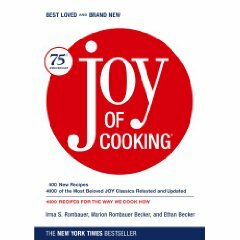 I can't believe I don't have a copy of Joy of Cooking yet. Isn't that like some kind of foodie sin? HA! Random fact about me: I hate bananas and cooked carrots. It's a texture thing. Thanks for hosting giveaway! This is an important backbone of all cookbooks that my collection is lacking. How fun would it be to spend the weekend reading the Joy of Cooking! I used to read my mom's tattered old version when I was a kiddo.